Now they’re never words that we thought we’d type, as despite several assaults on the court, we’ve remained immune to possessing anything vaguely resembling balling acuity. Case in point? 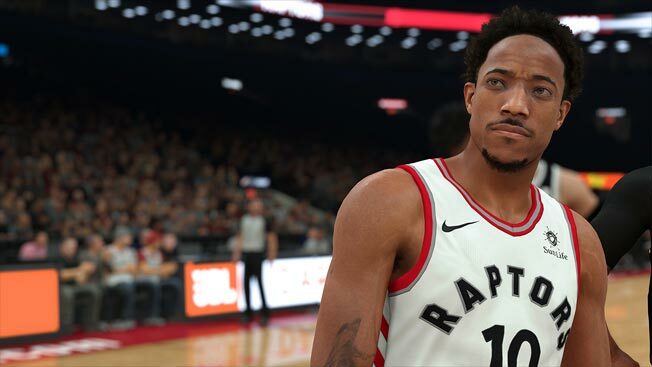 The full-on expanded MyCareer in NBA 2K18 – just a small part of a massive package. No dirty double entendre intended (but since it worked out as one we’ll take credit). So, when one part of a game is both the best and worst of it, where do you go? Well, the fantasy management part – MyGM - is a hoot for those (like us) who have less than zero natural ability. Then there’s the general outside of career play. This really wows, with presentation that every other sports game must ponder, curse and try desperately to emulate. All the real NBA teams feature with the real players (and our DJ), while the game remains reasonably easy to get into and play without having to absorb an encyclopaedic manual. The addition of” The Neighborhood” (sic) to MyCareer is a big one – getting a haircut, a tatt or doing the mini-game thing is fab - except for that microtransactional moneygrubbing. A full-price title should NEVER go there. But then, it’s the way of the world today – and the likes of the NBA. Hmm, maybe NBA 2K18 is the ultimate real-world sports sim?